We completed the sensitive refurbishment of the historic headquarters of internationally renowned German biscuit manufacturer, Bahlsen. 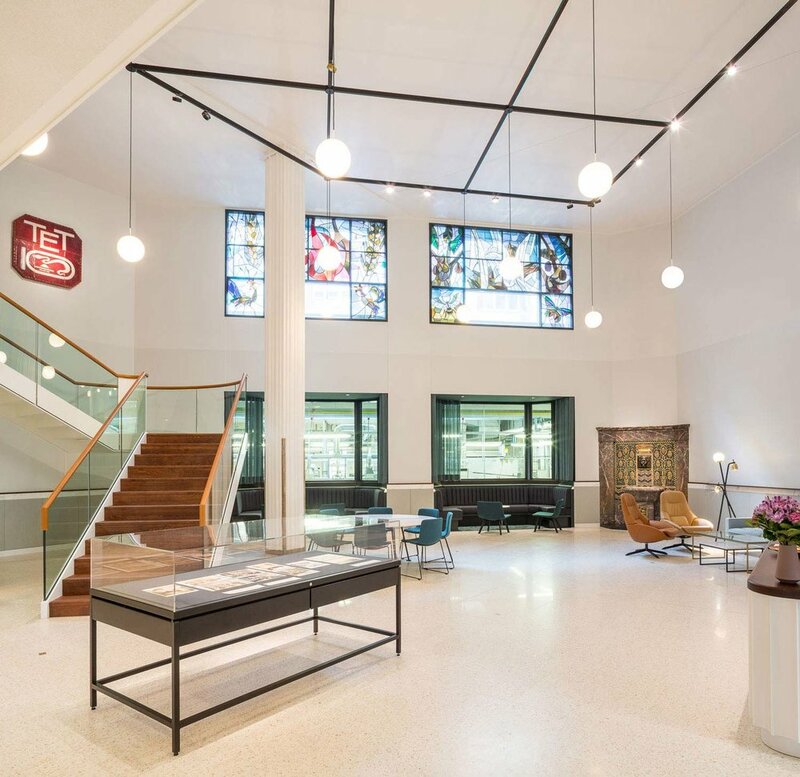 Borne out of a desire to open the building up to the public, the extensive refurbishments to the headquarters were focused on the Art Nouveau-inspired façade, the barrel-vaulted foyer and the reception area. We felt a need to move away from a corporate aesthetic. Whilst the design approach maintains a level of refinement, we wanted the spaces to feel like one was at home, giving a more grounded and relaxed air and informing the way in which visitors and staff might appropriate the space. This approach towards the domestic informed all the decision-making, from the warmth of the light and the choice of furniture to the height of the reception desk and the level of polish in the terrazzo floor. We designed a space to enliven and encourage use, creating opportunities to lean, linger and chat. 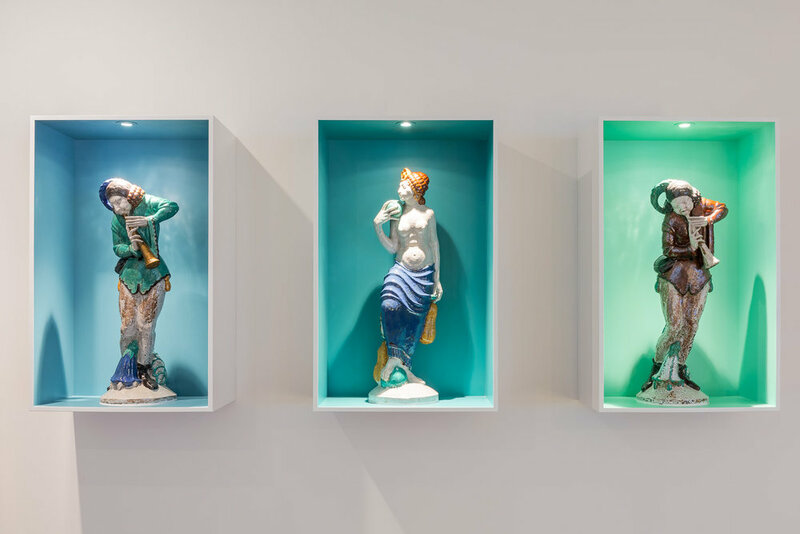 Inspired by Bahlsen’s confectionery offer, we were keen to infuse moments of pride and storytelling into the space. Brass replicas of Bahlsen’s famous Leibniz biscuits were inlaid into the new terrazzo floor. The cladding of the new reception desk borrows its form from the fabrication equipment found on the factory production line. The bay windows, which originally afforded views into the factory floor, had been closed off during the last refurbishment of the space. We opened these views back up to offer a glimpse into Bahlsen’s test kitchen and R&D lab, whilst also introducing spaces for informal meetings. The refurbished building is open to the public, admission free, from Monday to Friday between 10am and 3pm. For groups of five or more, prior registration is required (phone: +49 (0) 511-960 2992). 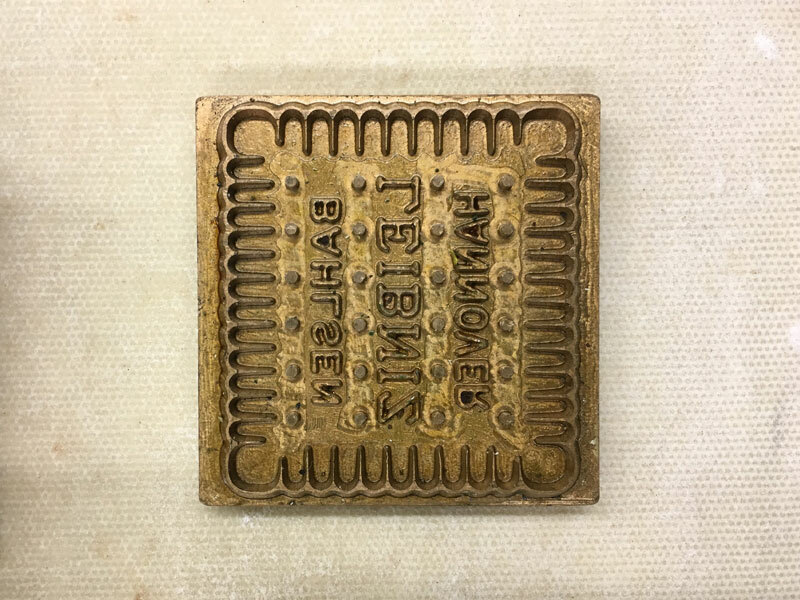 Beautifully crafted brass moulds for biscuit manufacturing. Going through Bahlsen’s 129 year old archive!